With a new console generation finally comes a new entry in The King of Fighters invitational tournaments. The last time Mai Shiranui had seen the big screen was nearly five years ago with the thirteenth numbered entry in this stories series. Despite some hiccups with trying out new things for the series, including not just one but two 3D fighters on the Playstation 2, number XIV revitalizes the series with fresh blood and a new tournament scene that’s available exclusively on the Playstation 4. The King of Fighters XIV’s expansive roster invites both brand new characters to the series as well as a new King of Dinosaurs that bears more than a few similarities to Mark of the Wolves’ Tizoc. With fifty different characters to make up the player’s three-person squad, there’s certainly someone to enjoy playing as whether you’re in the mood for a vortex play style or perhaps just want to give the opponent a hearty suplex. All but two characters are unlocked straight out of the gate, with both the sub boss and XIV’s signature final boss being available after a single playthrough of Story Mode. The King of Fighters XIV also offers a great number of modes for those that aren’t looking to take their team online against the world. A new story puts characters through the gauntlet of teams looking to take part in the fourteenth King of Fighters Invitational Tournament. While it plays out much like any other fighting game’s arcade mode with a series of unrelated matches, SNK peppered the fights with a number of character-specific intros depending on which fighters are on the field. No matter which teams take part in the Story Mode, the last two fights take place against Antonov and a secret final boss that’s well deserving of wearing the title of Final Boss on the higher difficulties. Sub Boss Antonov’s foolhardy antics in the story made him one of my personal favorite newcomers to the roster (and the simple fact that he’s one of the few pure grapplers in the roster helped secure that interest). The core gameplay of The King of Fighters series has always been more grounded than some of its contemporaries (especially compared to the ‘anime’ fighters of BlazBlue and Melty Blood). Even with only four buttons, two punches and two kicks, the complexity of inputs to activate various evasive maneuvers and special powered modes (Max Mode, and special Neomax moves once in that mode) to keep matches flowing at a quick pace and hype levels at an all-time high. Cancelling one move into another might be a staple in Street Fighter, but in The King of Fighters XIV, such a common action takes a more deliberate approach to fighting with its slower pace. Missing an attack or getting blocked at an inopportune moment can routinely lead to taking a combo to the face, so knowing when to exercise caution is an important lesson to learn. During my online matches, I would fall into an old habit of trying to mash inputs one after another to make quick combos come out. King of Fighters XIV’s engine has some tolerance for mashing buttons, but I’d have much better luck taking a breath and waiting for one attack to connect and try different timings to see how attacks link. With a handy training mode, there was always time to step away from online and practice simple combos until they became muscle memory. Where The King of Fighters XIV ultimately falls short against other fighters across the platform is in its graphical fidelity. While the experience runs at a buttery smooth 1080p60 (when not in laggy online matches), the graphics fail to take full advantage of the Playstation 4’s technical capabilities. The graphics have certainly come a long way since the initial reveal trailers where the character models could easily be compared to those from the PS2 era. Each of the fifty playable fighters in the roster have their own style and swagger, and while the graphics don’t showcase their individual personalities, the character designs certainly do. 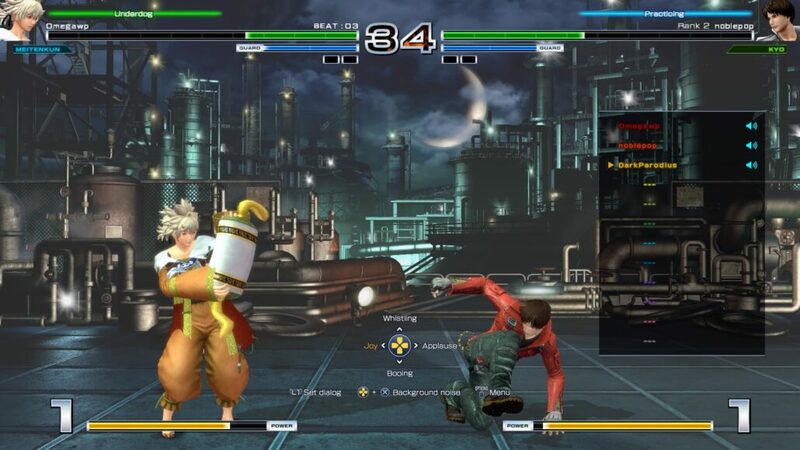 Online play offers the usual ranked and player matches, both with matches of single fighters and teams of three. A new Party Mode allows up to six players to go head to head each in the control of a single character, something that’s been done at local tournaments for years and I’m glad to finally see online integration. Prior to XIV’s official release, the online servers were fairly barren, save for a few reviewers and a pool of players that had been able to purchase the game prior to release. Even in matches against the same player, I would have wildly varying matches in terms of quality. When the online servers work, they work incredibly well. However, I had a few matches that felt as though both players were fighting through a field of molasses. Lag is one of the worst things to experience in a fighting game and even with the day-one patch that brings the game up to version 1.01, some of the matches turn into dramatic slideshows where whoever can mash out light punches first. Whether you’re picking up XIV as your first King of Fighters title or someone that’s been tackling every new invitational, sometimes it’s good to hit training mode and learn the basics. The new tutorial mode works wonders to help explain the game’s new systems and gauges, each skill integral to reaching one’s potential. Movement has always been a big part of what makes King of Fighters unique, with simple things like short hops and rolling to help clear the gap and set up a more aggressive neutral game. A new challenge mode offers to teach some basic combos, similar to Street Fighter’s recent Trials Mode, but doesn’t quite do much to help teach viable combos for normal play. Instead, each character is given five different trials to complete that range from linking a normal attack into a special move all the way into multi-input attacks that combine different attacks together and culminating in a flashy Climax special, something that’s more for styling on one’s opponent than actually being viable in a serious match. Watching two veterans compete (which now you can do in the game, thanks to some of the expanded streaming functionality and Live From Playstation built-in framework) can be a delicate dance of playing footsies and moving in and out of attack range before unleashing one dangerous combo into a character’s signature special attack. While I am by no means anywhere close to that competitive level, watching these matches and trying to emulate what I’ve seen in the training room is a greatly enjoyable part of improving my own skill in XIV. After a five year vacation since the last entry, The King of Fighters XIV has been a long awaited entry in my pantheon of fighters. Though I don’t live near a local scene to train and compete in on a regular basis, I’m looking forward to taking my team online against those around the world. The King of Fighters XIV is a solid entry that’s sure to be played in tournaments for the next couple of years and establishes a foundation for newcomers to pick up a controller and learn what the hype is about.